The number of people working in downtown Nashville has grown grew by 25 percent in just three years. 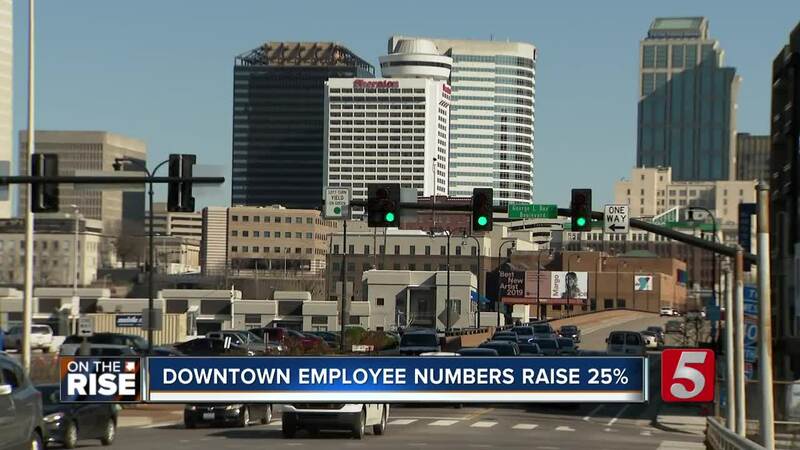 NASHVILLE, Tenn. (WTVF) — The number of people working in downtown Nashville has grown by 25 percent in just three years. According to census data from Nashville Downtown Partnership, in 2015, there were 57,230 people working downtown. In 2018, that number had grown to 72,000. "Phenomenal growth, it's incredible," said Metro Council Member John Cooper. "I think a lot of that is in a couple of projects in particular, Capitol View and the new Bridgestone headquarters." According to Cooper, however, the growth seen in the previous year will be small compared to growth seen from Amazon locating itself in Music City. "The next project is going to be much bigger. You have bigger projects coming on in the coming years and however frustrating it is in downtown Nashville, it's going be even worse and probably the next report could be up at 30,000 workers," he said. will cut down on congestion. "You may be at 72,000 jobs downtown, however there are several hundred thousand jobs in the county and those people need to get to work too. They're primarily going to get to work in cars and whether it's autonomous, self driving or car pooling, the transportation issues are not just limited to downtown," he said. Cooper said he believes the next census will show employee numbers in excess of 100,000.